Jungle Red Writers: Best Birthday Present Ever! HANK PHILLIPPI RYAN: There’s one critical thing every book must have. Yes, a great character, and a great setting, and an important problem and a lot of secrets and a wow of an ending. But before all that. There’s one pivotal thing every book needs. The germ, the gem, the nugget. The perfect unique twist or moment or action. In other words: A good idea. And the terrific Gigi Pandian got one for her birthday. (and leave a comment to be entered for a copy of MICHELANGELO’S GHOST! Two years ago, I’d figured out the basic ideas that formed my latest novel, MICHELANGELO’S GHOST: A lost work of art linking India to the Italian Renaissance. A killer hiding behind a centuries-old ghost story. And a hidden treasure in Italy’s macabre sculpture garden known as the Park of Monsters. I loved this new story I was crafting with an India-Italy connection. All of my Jaya Jones Treasure Hunt mysteries involve a present-day crime linked to a treasure from India’s colonial history, and I felt like I was well on my way—but there was a problem. 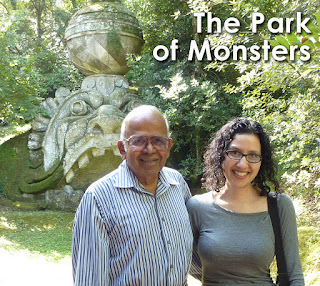 I hadn’t visited Italy in nearly two decades, and I’d never been to the Park of Monsters. My silly husband has never been fascinated by Italy (I told you he was silly! ), so I was preparing to take this research trip on my own. I’ve always been a good solo traveler, but the universe lined up to make sure I didn’t have to take this trip on my own. Last year, I turned 40. Within a few months of my birthday, my mom turned 70 and my dad turned 80. (Yes, this is how we’ve always been able to keep track of each other’s ages!) Both of my parents were anthropologists before retiring, and my dad is originally from India, so starting when I was 10 years old they began taking me with them when they traveled abroad. To celebrate our milestone 40/70/80 birthdays last year, we decided to take a trip abroad together—just the three of us, like we hadn’t done since I was a kid. 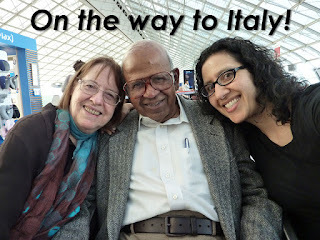 When I learned my father had never been to Italy, that settled it: we’d travel to Italy as our family trip. We’d visit Rome for my dad and the Park of Monsters for me. Have you heard of the Park of Monsters? Also known as the Gardens of Bomarzo, it’s a Renaissance garden located between Rome and Florence built by eccentric nobleman Pier Francesco “Vicino” Orsini, that after centuries of neglect is now a popular destination for both horror film-makers and Italian families with small children. The park has always fascinated me because the gigantic, moss-covered stone statues are like oversize gargoyles, and they’re filled with such personality. My favorite is the ogre, with its wide mouth serving as a door that leads to… not a dark dungeon, but a picnic table! I’m not telling this story here because it was a fun trip (even though it was great to relive the spirit of those childhood family travels—this time with none of my pre-teen eye-rolling). I’m sharing it here because the trip had an added bonus: traveling with my parents turned out to be essential to writing Michelangelo’s Ghost. Before I left for Italy, the novel had a rough draft plot and some scenes I thought were rather exciting. But… It didn’t yet have a title. It didn’t have its main twist. And most importantly, it didn’t have its heart. I’ll tell you a secret: at the time, Michelangelo wasn’t involved at all. But once I was in Italy, it was impossible not to breathe in the rich artistic history everywhere I turned.My father—who’s basically a walking encyclopedia—made an off-hand comment about Michelangelo being difficult to work with and not taking apprentices. With that, the story fell into place like a curling row of dominoes. Michelangelo and the mystery linked together perfectly. I don’t know how I didn’t see it sooner, but that’s how writing goes! I’m sorry (but not sorry) that I’m not going to reveal the twists here. But I can tell you this much: I do my homework to get my history right. The treasure and the twists are historically accurate. And next week, you can read the mystery and history in Michelangelo’s Ghost. Do you enjoy traveling by yourself, or with your family or friends? Or are you more of an armchair traveler who loves to experience the world through books? HANK: How about you, Reds? Do you like your travel real or in your imagination? Or-- if you’d rather--what’s the best birthday present you’ve ever received? (Oh—and the winner from yesterday of SAY NO MORE is SUSAN in Williamsburg! 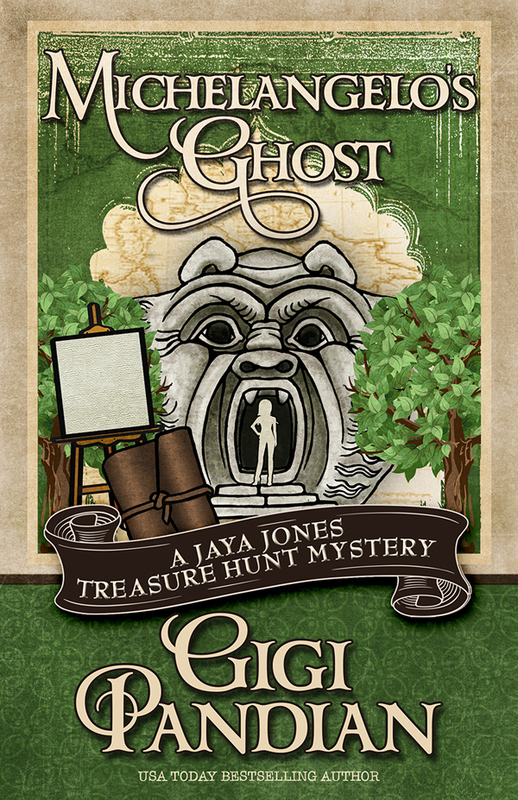 When Jaya’s old professor dies under eerie circumstances shortly after discovering manuscripts that point to a treasure in Italy’s Park of Monsters, Jaya and her brother pick up the trail. From San Francisco to the heart of Italy, Jaya is haunted by a ghost story inexorably linked to the masterpieces of a long-dead artist and the deeds of a modern-day murderer. USA Today bestselling author Gigi Pandian spent her childhood being dragged around the world by her cultural anthropologist parents, and now lives in the San Francisco Bay Area. 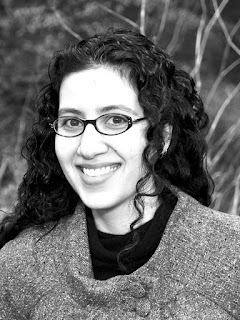 She writes the Jaya Jones Treasure Hunt mysteries, the Accidental Alchemist mysteries, and locked-room mystery short stories. Gigi’s fiction has been awarded the Malice Domestic Grant and Lefty Awards, and short-listed for Macavity and Agatha Awards. “Michelangelo’s Ghost” sounds so intriguing, Gigi . . . I can’t wait to read it! Your trip sounds so marvelous; what a great birthday present. And how lovely that you were able to make it a family travel trip. Although I do travel alone on occasion, I’m not fond of traveling by myself. Most of my traveling, however, is the armchair kind and I’m looking forward to visiting the Park of Monsters with Jaya. 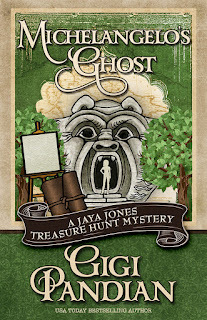 Happy birthday, Gigi, and I can't wait to read Michelangelo's Ghost, the newest book in the excellent Jaya Jones series! It was great to see you at NOLA Bouchercon, and have you sign my copy of the Masquerading Magician (I love Zoe and Dorian)! How wonderful you were able to go on a research trip and to celebrate your family's triple milestone with a trip to Italy together! 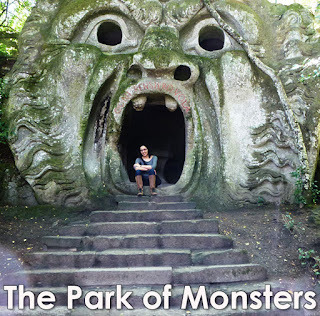 I have not been to that part of Italy and had never heard of, or seen, the Park of Monsters. I totally love travelling alone. In fact, I prefer it. Maybe it is a combination of being an only child, and studying geography in university, but I always did have a wanderlust that the rest of the family did not share. I did my first solo hostel/backpacking trips to Europe at 19 and 23. Once I had a full time job, I also had to travel solo 95% of the time for work several times each month. I also went on 1-2 mystery conferences each year (Bouchercon, Left Coast Crime, other regional mystery conferences) alone but that doesn't seem like solo travel since I see/meet up with both familiar faces and reunite with long distance friends. And of course, reading mysteries is the best type of armchair travel to places I cannot or have not yet been to in person! Happy birthday to you, your mom, and your dad (ok, a bit late-but heartfelt) and happy soon to be book birthday. I have never heard of the Park of Monsters. You've added another stop on my bucket list. And since this one means a trip to Italy, I can only thank you. Michelangelo's Ghost sounds wonderful. I love to travel. And I love to travel alone. I like to wander the back roads of countries and the backstreets of cities making friends along the way. 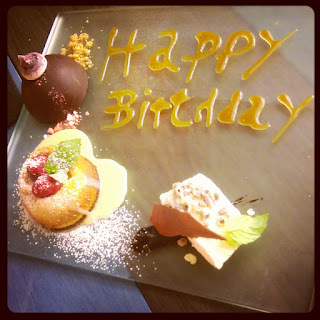 Happy Birthday to everyone. What a great trip. I like to go on road trips and I like to read about traveling. Now I have to go back to Italy. How did I miss Park of Monsters? Putting Michelangelo's Ghost on my TBR list. When my kids were little we took them everywhere, starting with Puerto Rico when the oldest was about 6 months old. We spent 6 weeks traveling by train in Europe when they were 7 and 13. Now my favorite thing is to travel with them and our grandchildren - go somewhere, rent a big house and a van. We spent a week on Sanibel Island with them, then a week in Tulum, Mexico, a week traveling in Ireland. I'm ready to plan our next. Congratulations and great to meet you at B'Con. Your garden on my list for our Italian trip. I like to roam around cities and photograph gardens on my own, but it's nice to meet up with my husband and/or kids in the evening. I love this story, Gigi, and what a treat you got to travel to Italy with your parents! Can't wait to read the new episode. I'm both an armchair traveler and a real one, although in the last few years most of my travel has been to mystery conferences in the US! My head is exploding with all of the great titles recommended here this week!! What Reds are reading, childhood favorites, and new (to me) authors!! Thank you, thank you. I have never traveled completely alone but I used to go with my husband on his business trips. His schedule would be packed from pre=breakfast to after-dinner. Generally I would join him in the evening. Otherwise, I explored alone -- Tokyo, Rio, Milan, New Orleans, Miami, Paris, London. I used public transportation and a guide book and discovered all sorts of treasures. I found that I like to go to museums alone, and I love walking tours. He is a retired consultant now, and he often travels to Kenya and Ethiopia. I would love to go, but he generally stays for just a few days. The airplane to ground time is not what I can handle now! How cool that the birthdays lined up like that and you were able to travel with your parents. Italy is definitely a place I'd love to go and the pictures from the Park of Monsters are so intriguing. I do remember from my college art history class that Michaelangelo was a bit of a prima donna and difficult as a person. I love how an off-hand comment like that can spark the idea for the perfect story twist. I'm okay traveling alone, but I also like traveling with friends and The Hubby (as long as I can get him to slow down a bit - he's a far more energetic tourist than I am although we had a wonderful time in NOLA together sightseeing). I guess it's because I like seeing things with other people and I don't like eating alone (it makes me depressed), but I like having alone time during the trip. Hallie, I also took only one trip with my parents, and it was when I was three, also. We took the overnight train from Hamilton, Ohio to Boston. I remember very vividly sleeping in the lower berth with my mother, and my dad climbing into the upper berth in his underpants! That memory made me goggle throughout my childhood, since there was just a curtain separating the sleeping compartment from the aisle. Gigi, I saw you at Bouchercon, but only once, and never got a chance to speak, I'm sorry to say. Love the back story about this book, and how much fun you had with your parents in Italy. What a fun way to celebrate those "big birthdays"! I have one of your books, but still haven't read it, for some reason. Will have to dig down into Mt. TBR and find it. oh, Gigi, I loved reading this. AND loved getting to spend a little time with you in New Orleans! I'm happy I was able to do some traveling with my parents as an adult, it was such an entirely different experience from the road trips and 2 week vacations to the beach we had when I was a little girl. I put my love for travel on hold for awhile. It just didn't feel right taking off and leaving my mom after she reached the age that travel was no longer fun or easy for her. But now, I'm easing back into it. And depending on where I'm off to makes all the difference in the world as to whether I go alone, or with Donald, or a fun few days off with girlfriends. Next year includes a week in Paris with girlfriends and I can hardly stand it. The Park of Monsters sounds so incredible! And what a great cover it makes. Yay, Gigi! Oh, gosh , we had family vacations when I was growing up..I was always a pill, I confess. All I wanted to do was read MAD Magazine, and I got yelled at for "not participating." But every time, when we'd drive out of the driveway on vacation moment one, my step-father would always turn to us kids in the backseat and say "How do you like it so far?" We thought that was "SO dumb." Now I remember it with great fondness. Kaye! YOu with pals in Paris! That city better watch out… Make sure you take video. Wow. Fabulous. Gigi, tell us more about the Park Of Monsters. SO strange. And more about MIchelangelo! What intrigued you? Lysa, email me at hryan at whdh dot com and i will connect you with MG Hennessey! AND THE WINNER of SAY NO MORE from Monday is SUSAN in Williamsburg! Send me your address via H ryan at whdh dot com and I will send you the ARC of SAY NO MORE! I like both real and imaginary travel. The books bring me to places I would never had thought to go and then, I decide to go for real. This book goes on my TBR pile. Happy Birthday to you all and that sounds like a most wonderful trip! I can't wait to read Michelangelo's Ghost. The Park of Monsters is definitely on my want-to-visit list. Thanks for a wonderful post. I'm on West Coast time, so just catching up now! Yes, I've always been surprised that the Park of Monsters isn't a bigger traveler destination. We were the only Americans I saw the whole time we were at the park. Most visitors were Italian families, with other Europeans as well. What drew me to the Park of Monsters was that I love all things mysterious -- as I'm sure many of you do! There's also so much MISSING history from the park, that there's so much for our imaginations to fill in, as other authors have done before me, such as Linda Lappin's Signatures in Stone -- a great mystery set at the park. Grace -- Yes, so lovely seeing you at Bouchercon, though it was too brief at the signing table, since Bouchercon is always a whirlwind! Kait and Grace -- Yup, I love solo traveling as well, since there's so much freedom. It's nice to have in the mix sometimes on my own and sometimes with the husband or parents or friends. Lucy and Gram -- Thank you! A belated Happy Birthday to you and your parents. How interesting to be raised in a family where travel was a necessary part of their profession. How kind that they included you in there travels from an early age. The yen for travel has always been with me. My family was more stay at home types. Books were my gateway to the world. The few times I traveled alone, I really enjoyed it. Being responsible for only myself; not having to answer "are we there yet? "; reading every single historical marker available. That is for me. Traveling alone is respite travel, feeding into my solitary nature allowing me to become an observer. I think I will run away today, no more dusting. Hallie! That's so fantastic that you traveled with your kids. I hope they were more appreciative than I sometimes was as a bratty kid who just wanted a hamburger ;). But NOW in my adult like I'm so appreciative that my parents dragged me all over the place. I hope you make it to the Park of Monsters. I didn't know about it during my first trip to Italy either, since it's not in most guidebooks. Margaret -- Yes, so great to meet you at Bouchercon. Sounds like you've got the perfect balance in your travels. Susan -- OH YES, traveling all the time sounds marvelous... When I was going through cancer a few years ago I fantasized about a round-the-world trip, but I haven't made that happen yet. Edith -- Thank you! You know, one of the unexpected cool things about mystery conventions is that the bring me to cool places I wouldn't otherwise visit, like New Orleans. Denise Ann -- Aren't there such great recommendations here? The Paris Librarian is one of the ones I immediately popped out to buy. And I"m with you -- if airline travel wasn't so cumbersome, I'd do a lot more traveling. Mary -- I've never formally studied art history, so I miss a lot of pockets of history, which is why random facts from people, books, museums, etc. spark such interesting ideas. Eating alone definitely takes some getting used to. Packing a picnic lunch is one of my tricks, when I'm not sure what type of restaurant I'll find while I'm out. Karen -- I'm so sorry we missed each other at Bouchercon. It's such a huge convention that it's too bad it's never possible to see everyone! What a wonderful birthday trip to make with your parents, to get insights from them for your book, and to visit the wonderful Park of Monsters. I love the one you chose for your cover. Happy Belated Birthday to you all! 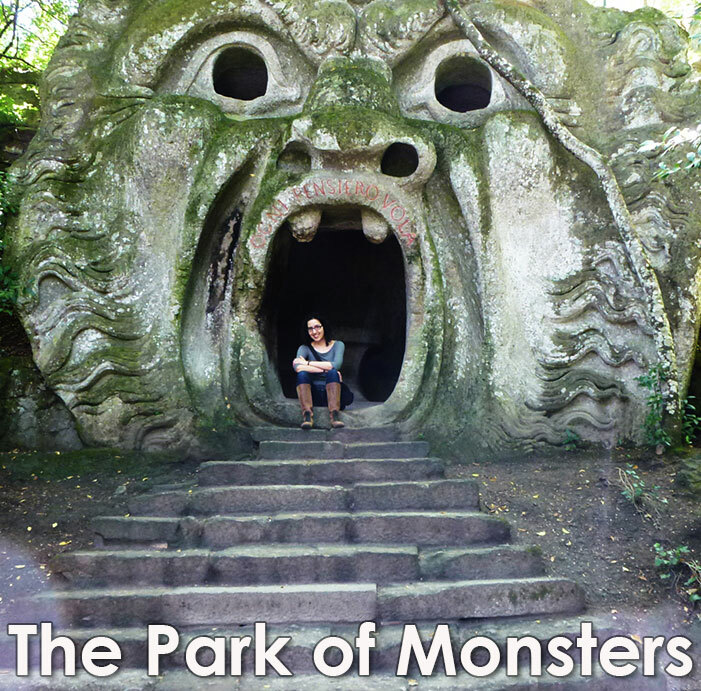 I've been to Rome several times and didn't know about the park of monsters. Now I have to go back! Danielle -- I hope you enjoy the book for some armchair travel! Melanie -- Thank you! Though it's a bit out of the way, the park is definitely worth the time to get there. Coralee -- Being able to be an observer through solo travel is a great way to put it. Celia -- Thank you! Yes, I'm really happy with the book cover illustration Henery Press created. I've been really fortunate with great book covers for both of my mystery series. Rhys -- Now you have the perfect excuse to return to Italy! Corals you are too funny? Are we there yet--is there any other question that is SO universal? And spellcheck changed Coralee to Corals before I could stop it! Sigh. Gigi, how did I not see you at Bouchercon?? Happy belated birthdays to you and your parents. I have to admit I'm a bit envious of your Italian jaunt with them. I grew up traveling with my parents. At first, road trips. We made the first of many drives to Mexico City when I was nine, and over the course of my child/teen years covered a good bit of the US as well. I was the weird kid who LOVED road trips. Then, when I was in my twenties we explored Europe together. They were such fun, and they did not come from adventurous backgrounds. On trips they made without me, they also went to Hong Kong, Japan, and South American. Your story made me miss them. They definitely infected me with the travel bug, and I actually really like traveling by myself. Cannot wait to read Michelangelo's Ghost, and putting Park of Monsters on my travel wish list! Happy Belated Triple Milestone Birthday to you and your parents! Can't wait to read the new book. I've read all the others. Although I often travel alone from Point A to Point B, I have always met up with friends or relatives at Point B. When I'm with relatives I usually spend part of each day alone because we have different interests. Ever since childhood I have loved to read about places I'll probably never get to, and I am one of those rare people who loves to look at someone else's vacation pictures! I love to travel and want to do more! Being "retired" has its perks. I just got back from a road trip with my husband and informed him we may not be travel buddies anymore. He had on TWO GPS units and of course they didn't agree on the route. I wanted to kill him. I did go to India a year ago with a female buddy. We traveled together pretty well but I found myself having to look after her a little more than I had anticipated. She is 7 years older than me and we are getting older. . .I have gone with my husband on domestic business trips and am well able to entertain myself while he is doing his thing. I'm currently debating whether to go to Wash. D.C. with him next month. This is yet another Of Gigi Pandian's wonderful books! I was fortunate to get an ARC. Do get this book and enjoy yourself. We spent a month in France for my 50th birthday, and it was the best gift ever! It didn't give me any stories, but it did heighten our love of food and cooking, and that has led to many great meals and spurred me to write foodie fiction. Congrats, Gigi, on another fabulous release! YOu know, there is SUCH a difference between okay food and fabulous food. France will do that to you! And Italy, too..
And hmm..I'll have to plan my 70th. Denise Ann, we'e just doin' our job. But you are so right--I got lots of new titles, too! Libby -- Oh, I'm thrilled that you enjoyed reading an ARC of the book! Hank -- Surely you must be joking about your next big birthday??? Whatever it is, I hope you're able to plan a most marvelous celebration. This sounds so good. I love to travel, but I'm basicay a coward. And shy. The idea of going alone.... YIKES!! Great post! I love to travel. One family trip that I enjoyed was when my Mom took my cousin and me on a weekend trip to Disneyland for my birthday when I was a tween. That was the only time my Grandfather was able to make it to my birthday since he had a busy career and could not travel great distance from home often. We had ice cream cake after dinner at a restaurant. Travelling with family is always fun because they love to travel too. Right now my cousin (older sibling to the Disneyland cousin) is travelling in Canada with her husband and singing at music (bluegrass) festivals in Canada . First time I travelled abroad on my own was when I travelled to the UK for my junior year abroad at Oxford. That was a memorable experience. My studies at Oxford was wonderful. One night I took the train to London to see the Royal Ballet and I had bought the cheapest ticket, which was the last row, in the theater. it turned out that this sweet couple I was sitting next to were parents of a ballet dancer in the Royal Ballet. They insisted on driving me back all the way to Oxford from London at night even if they lived in Aylesbury, not Oxford. They did not want me to travel alone on the train at night. I travelled "alone" to Europe, though I actually went with a tour group for a 14 day tour of Europe - France, Switzerland, Austria, Germany and Italy. After the tour, I took the train from Italy to Denmark and I travelled to Sweden for a day from Copenhagen. Always have fun travelling alone or with family/friends. On another note, you and Diane will be signing books at Book Passage in October? p.s. Happy belated birthday to your parents and to you! 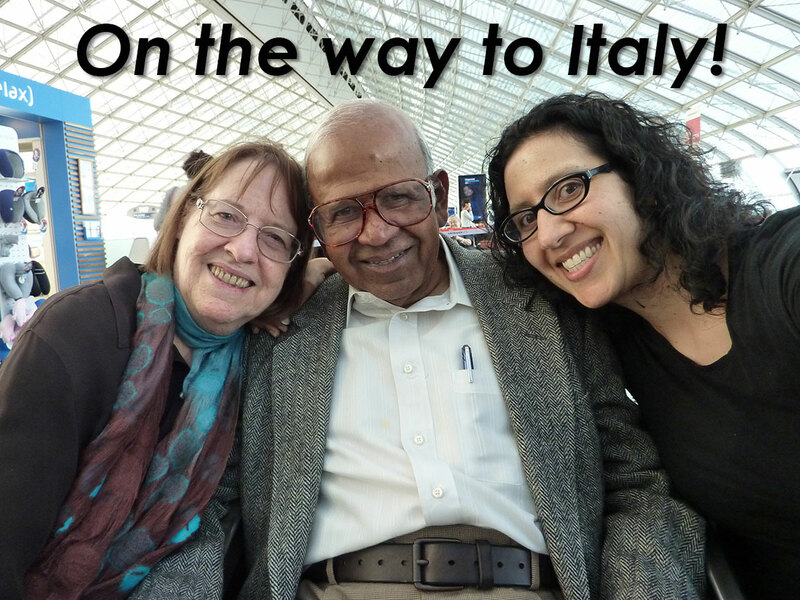 That was a wonderful birthday gift - a family trip to Italy! Gigi, happy birthday to you, your mom and dad. Can't wait to read you're latest. You always do such a fascinating and realistic job of blending fact with fiction. Congratulations on your latest. Good night everyone! Thank you so much for a wonderful day! And Gigi, congratulations and hope you are selling piles of books! See you all tomorrow for an inside look at .. Well, it's fascinating! And YES, Diane Vallere and I will be at Book Passage (San Francisco Ferry Building location) on Saturday October 15 at 2pm. Will we see you there? Nancy -- Thank you so much! And thanks to everyone for your enthusiasm and for sharing your own stories today! It's always such fun to visit the Reds. An especially big thanks to Hank for hosting me!